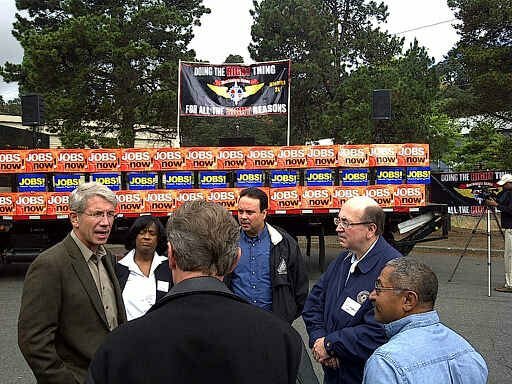 Oregon Democratic Congressman Kurt Schrader speaks with IAM leaders during a stop of the ‘It’s About Jobs’ bus tour sponsored by the International Union of Painters and Allied Trades (IUPAT). Left to right (facing camera): Rep. Kurt Schrader (D-OR), IAM Executive Assistant Diane Babineaux, Western Territory GVP Gary Allen and IP Tom Buffenbarger. IAM leaders took part this week in the West Coast swing of a coast-to-coast bus tour organized by the International Union of Painters and Allied Trades (IUPAT). The ‘It’s About Jobs’ tour is designed to support candidates who understand the need for job creation programs and policies. IAM President Tom Buffenbarger, Western Territory GVP Gary Allen, Executive Assistant Diane Babineaux and others travelled with the bus from a rally at District 751 headquarters in Seattle to events in Vancouver, WA and Portland, OR. At each event, IP Buffenbarger stressed the importance of programs designed to create more jobs. “It’s the key to a good standard of living, decent housing, education and health care and a dignified retirement — all things that organized labor has worked to achieve,” said Buffenbarger. At each stop, Buffenbarger drew attention to “Bite Back,” the two-minute internet ad developed by Ur Union of Unemployed (UCubed) that dramatically urges millions of unemployed and under-employed Americans to vote in the upcoming midterms. The IAM will rejoin the IUPAT tour at different stages as it moves across the country in a 5,000-mile, month-long journey aimed at communicating with members and candidates.